Most often people heard about affiliate program and their lots of earnings. 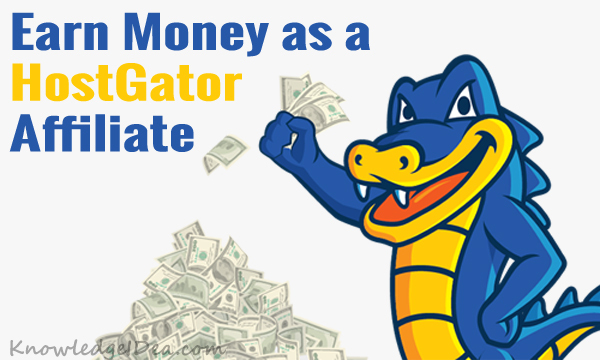 HostGator affiliate program is the one of the richest affiliate program, which pays up to $125 per qualifying sign up. HostGator is a web hosting provider company founded in 2002 by Brent Oxley, their headquarter based in Houston, Texas, United States. 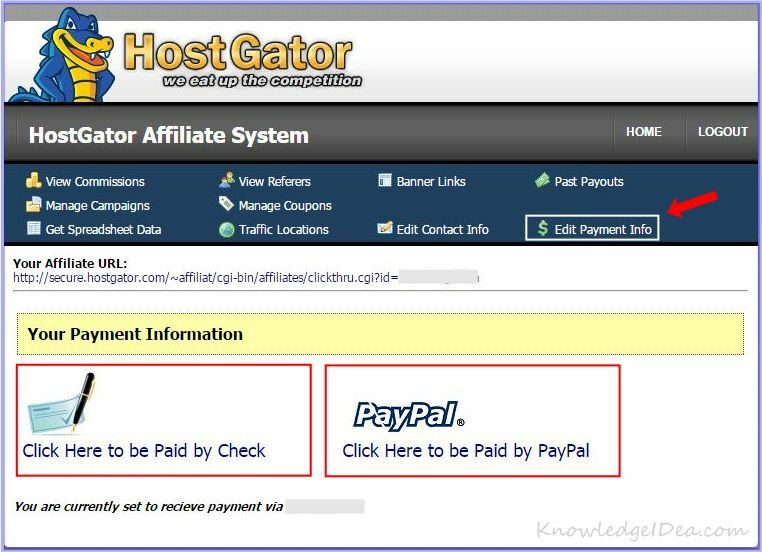 Can I Join HostGator Affiliate Program? Yes, Anyone can join HostGator affiliate program and start his online business. There is no hidden fee or registration fee, complete free of cost platform. 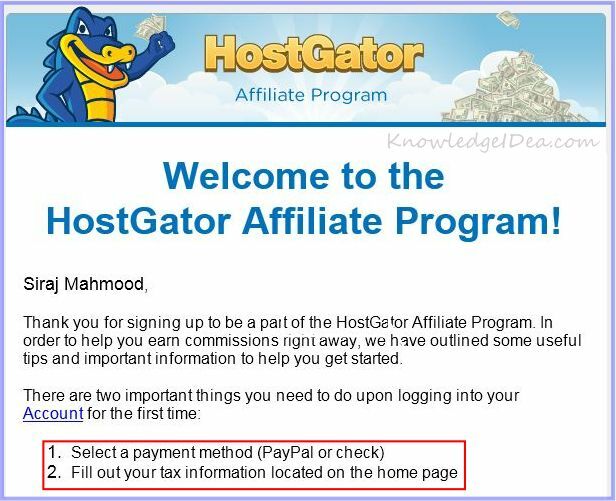 Just you need to sign up for HostGator affiliate program then they will give you a complete interface/account, where you will control your sales, affiliate earnings etc. After Sign up – What I to do Now? Select/Choose your payment method for withdraw (PayPal or Check). Fill out your tax information, which you can see on your homepage (HostGator Affiliate Program Dashboard). If you do not fill tax form then unfortunately they will not pay you so above given two instructions should be your first priority. Where is My Referral Links and Banners? Referral link and banners is the actual stuff, which you will be use to promote HostGator hosting on your blog’s articles or websites. You can insert HostGator banners on your website sidebars and inside web hosting relevant articles. When someone click on these banners and redirect on HostGator website, if this person buy any thing like hosting or domain service so HostGator will pay you a specific commission for this affiliate. Review the below image, In which we highlight HostGator promotion stuff like links and banners. Where I Can Promote These Promotion Stuff ? Referral banners, links and custom coupon codes are considered as promotion stuff in HostGator affiliate program. You can promote these provided stuff on your blog’s and inside their articles. You also can recommend friends on social media sites. Finest way to insert these banners and links while writing guest blogging on other’s communities. What is Custom Coupon Code in HostGator Affiliate Program? HostGator provides complete interface, where you can generate custom coupon code with your company or blog name. This coupon code will be unique and trackable during usage. Customer will use this custom coupon code during billing on HostGator. Customer will get this coupon code from your website or blog, where you are advertising this coupon code for discounted prices. You also can append this coupon code on banner or can depict inside articles. 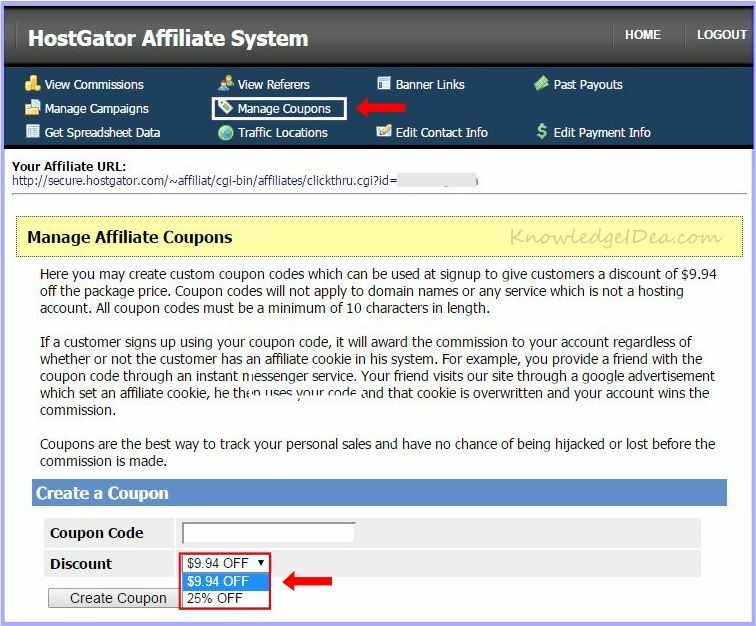 Currently HostGator provides two types of discounted custom coupon codes. One is HostGator 25 % OFF Discount Coupon code and another is $9.94 OFF Discount coupon code on entire billing invoice. Review the below coupon code generating interface image for better understanding. How I Can Withdraw My Payment from HostGator? You can payout your earned commission through two ways, First is PayPal and Secondly via Check. After sign up, it is your responsibility to setup your payment withdraw gateways. Eventually, I have one word for HostGator affiliate program “Incredible”. Never miss this chance to earn money without any hard-core struggle, it just up to you because HostGator affiliate program have no threshold of earning, you can earn as per your capacity. So Why are still waiting -> Sign up for HostGator Affiliate Program. Let us know, if you think that you are on right place and found beneficial information for your journey. If you want more elaboration on this topic then let me know via comment. You should contact to HostGator affiliate team in this concern. Your reasons are nearly true about HostGator affiliate but their algorithms to calculate your earring are maybe strange.